Following the collapse of the Taliban regime in December 2001, Afghan leaders met in Bonn, Germany, determined to restore governance to Afghanistan and to create a durable peace. Although the Bonn Accords called for the inclusion of estranged factions into the new political system, the Afghan government and its international partners lacked the strategic commitment to pursue reconciliation, sparking renewed insurgency in 2003. 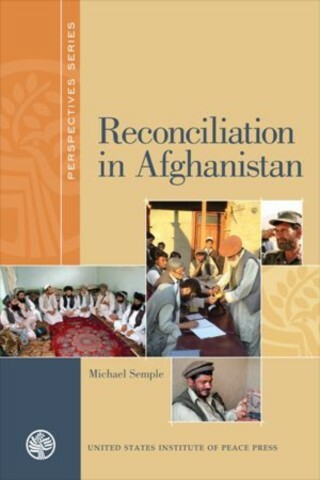 In this timely and thorough volume, Michael Semple analyzes the rationale and effectiveness post-2001 attempts at reconciliation in Afghanistan. He explains the poor performance of these attempts and argues that rethinking is necessary if reconciliation is to help revive prospects for peace and stability in Afghanistan. Semple’s findings reveal that the key parties to the insurgency are Afghan political actors driven by objectives related to their roles and status inside Afghanistan. Further, the majority of senior Taliban figures who have reconciled have done so through a process best described as political sponsorship, in which they have secured acceptance into the present system through political or tribal links. Although official reconciliation programs have failed and formal institutions are widely considered to be inaccessible, corrupt, and unreliable, reconciliation is indeed possible in Afghanistan, particularly through informal networks and traditional Afghan reconciliation practices. Semple contends that progress lies in an incremental peace, one in which identifiable networks hitherto estranged from the current political reality and engaged in insurgent violence reach an accommodation with the government that addresses their network-specific grievances and interests. He concludes with specific and numerous recommendations for the Government of Afghanistan as well as for the international community. "This study presents an excellent illustration of the diversity of the groups and networks that are grouped under the term Taliban by the media and inexperienced analysts. Reconciliation in Afghanistan is well conceived and well written. It effectively suggests series of steps Afghans, the United States, and the international community might take as they all seek to turn a new page in the efforts to address the security and stability issues that continue to plague Afghanistan and the region." "As the Obama administration develops and implements its revised strategy on Afghanistan and Pakistan, a principle topic of debate is “reconciliation”—how to deal politically with Taliban and other insurgents who are not pursuing al-Qaeda’s global objectives in search of a political solution. Michael Semple brings to bear a wealth of practical experience on the ground in Pakistan and Afghanistan. He has spoken in-depth with more insurgent commanders than virtually any international official, and his long service in the region has equipped him with the knowledge, language skills, and personal networks to analyze such contacts in depth. The result is the most detailed and knowledgeable road map to date for how to pursue dialogue and negotiation with Taliban and other Islamist guerrillas in the area that are today sheltering the leadership of al-Qaeda." "Michael Semple’s Reconciliation in Afghanistan is based on a vast knowledge of the country and many discussions with the members of the Taliban. It is the best blueprint available about how to accomplish the complex and very necessary task of bringing ‘reconcilable’ Taliban into ordinary Afghan politics, arguing that it is far from impossible, but appropriately underlining the many obstacles that will be encountered on the way to this goal. Semple’s study is deeply researched and well-calibrated in its analyses and judgments." Michael Semple served as deputy to the European Union special representative to Afghanistan in 2004-2007.